Note: Article titles link to penultimate drafts (or self-archived finals if open access); journal titles link to final version if available. Both links contain abstracts. 2017: Feltz, A. & May, J. “The Means/Side-Effect Distinction in Moral Cognition: A Meta-Analysis.” Cognition 166: 314–327. 2014: Shepard, J. & May, J. “Does Belief in Dualism Protect against Maladaptive Psycho-social Responses to Deep Brain Stimulation?” American Journal of Bioethics Neuroscience 5(4): 40–42. 2013: May, J. “Because I Believe It’s the Right Thing to Do” Ethical Theory & Moral Practice 16(4): 791–808. 2011: May, J. “Relational Desires and Empirical Evidence against Psychological Egoism” European Journal of Philosophy 19(1): 39–58. 2019: Kumar, V. & May, J. “How to Debunk Moral Beliefs.” Methodology and Moral Philosophy, eds. Jussi Suikkanen & Antti Kauppinen. Routledge. 2018: May, J. “The Limits of Emotion in Moral Judgment.” The Many Moral Rationalisms, eds. K. Jones & F. Schroeter, Oxford University Press. 2018: May, J. “The Limits of Appealing to Disgust.” The Moral Psychology of Disgust, eds. Nina Strohminger & Victor Kumar, Rowman & Littlefield. 2017: May, J. “Getting Less Cynical about Virtue” (commentary on C. D. Batson), Moral Psychology, Vol. 5: Virtue & Character, W. Sinnott-Armstrong & C. Miller (eds. ), MIT Press, pp. 45-52. 2016: May, J. “Repugnance as Performance Error: The Role of Disgust in Bioethical Intuitions.” The Ethics of Human Enhancement: Understanding the Debate, S. Clarke, et al. (eds. ), Oxford University Press. 2018: May, J. 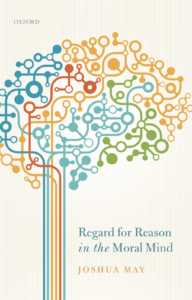 & Kumar, V. “Moral Reasoning and Emotion.” The Routledge Handbook of Moral Epistemology, eds. K. Jones, M. Timmons, & A. Zimmerman, Routledge. 2011: May, J. “Psychological Egoism.” Internet Encyclopedia of Philosophy. 2018: “A Limited Skeptical Threat”, commentary on John Doris’s Talking to Our Selves, Behavioral & Brain Sciences, Vol. 41, e52 (2018): 35-6. 2014: Review of Just Babies: The Origins of Good and Evil by Paul Bloom (2013, Crown), Metapsychology, Vol. 18, No. 33. 2010: Review of Experimental Philosophy ed. by Knobe & Nichols (2008, OUP), Philosophical Psychology, Vol. 23, No. 5, pp. 711-715. 2009: Review of Willing, Wanting, Waiting by Richard Holton (2009, OUP), Metapsychology, Vol. 13, No. 23.